When the Accelerated Mobile Pages (AMP) team set out to help make mobile experiences great for everybody, the objective wasn’t just to improve a user’s engagement with content. We knew the experience people had with ads was equally important to help publishers fund the great content we all love to read. The AMP team laid out four core principles that would guide the innovation on the AMP ads roadmap and get us to a world where ads are as fast and engaging as the content we value. 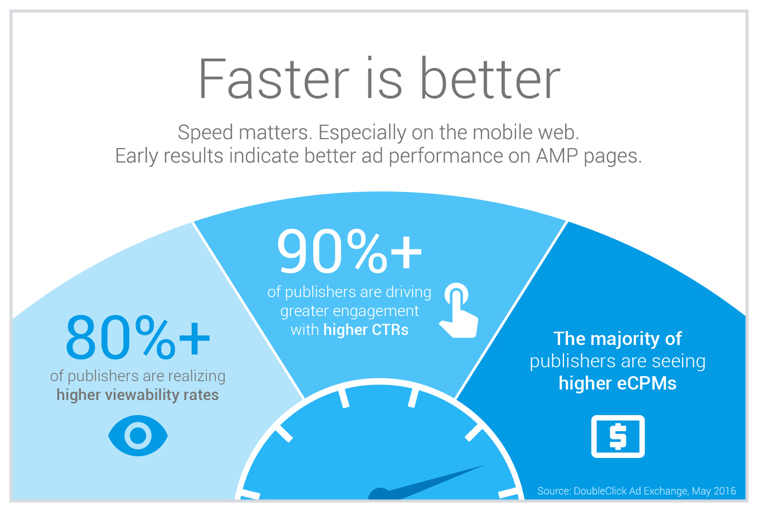 We recently took a moment to review the progress made and see how ads on AMP are doing. We compared ad performance on AMP and non-AMP mobile pages across 150 publishers (large corporations and small businesses in different geographic regions) on our programmatic platforms. The preliminary results are encouraging. While this makes for a promising start, we’ve barely scratched the surface of what’s possible with ads in AMP. There’s much work ahead for us and the rest of the industry — including our third party ad tech partners — to make advertising experiences on the mobile web as great as content experiences with AMP. We’re both committed to and excited by that. If you’re curious about what lies ahead for the broader AMP project, check out the AMP roadmap.